A while ago Nicholas Rohde wrote a series of articles that got some people upset. He used an economic model to look at which batsmen had made the greatest contribution. His basic method was to compare the runs they had scored to the runs that an average batsman would have scored finding the added value that they provided their team. I read through his article and was impressed with his approach despite feeling there are some issues in the way that he interpreted his results. He did not take in account the extra frequency of matches in the modern era when suggesting that a current selector should pick a young Tendulkar over a young Bradman. Bradman should be judged on his opportunities, not on someone elses (Bradman played in 87% of Australia's matches during his career, only just behind Tendulkar's 92%). However the background theory is actually quite intuitive and also provides some very interesting results. I took his idea and applied it to test bowling. My method was probably not identical to his, but what I did was break down each year to find out how many runs bowlers had conceded and how many wickets had been taken in that year. For each bowler I then found the total runs and wickets in the years that they played, to give a value for what the average bowler would have done. There are some issues with this method for figuring out added value, but I feel that it gives a better guide than any other practical method I can think of. Shabir Ahmed played 10 tests between 2003 and 2005 for Pakistan. He took 51 wickets for 1175 runs. In 2003 there were 1305 wickets taken for 47145 runs. 2004 had 1555 wickets for 54916 runs and 2005 had 1508 wickets for 50377 runs. The total runs per wicket for those three years was roughly 34.9. So we multiply his wickets (51) by 34.9 to get 1780. We then subtract the runs he conceded (1175) to get his value of 605. Effectively he saved his team 605 runs more than an average player would have. So once we add up the figures, who comes out on top? First we'll look at the aggregates, and there are a few familiar names there. We notice that the likes of Barnes and Davidson are a lot higher than they would be in a pure wickets table. Muralitharan is miles ahead of McGrath in 2nd place. Regardless of what Bishan Singh Bedi thinks his record is formidable. Once his action was cleared he still had to put the ball in the right place, and do the right thing with it, and he did that, time after time after time. Glenn Mcgrath jumps over Anil Kumble and Shane Warne into second spot. Both he and Shaun Pollock changed the way that bowlers thought about opening the bowling, with his metronomic accuracy and aggressive approach being incredibly valuable to his team. His economy being the difference between him and Warne on the table. Now when we are looking for the best bowler consistency is important, but really we want to know who could be expected to do the best in the next game, so how well they do per innings is more important. The name at the top is one that most readers won't know. The 1938 Wisden said this about Jack Cowie, "Had he been an Australian, he might have been termed a wonder of the age." During the 12 years that he played, New Zealand only played 9 test matches and he famously only got to bowl once to Bradman, getting him out for 11. Hutton described him as the best bowler he had faced. An example of how much better Cowie was than his contemporaries is that the rest of New Zealand bowlers averaged over 54 in the same 9 tests. The third name on the list, Dainty Ironmonger didn't make his debut until he was 45, but was very effective with his left-arm slow medium, and very ineffective with the bat (having a similar average to Chris Martin). Murali is the first of the recent players on the list, which is a credit to him, as he kept that up for a very long time. Steyn is also remarkably high, ahead of the likes of Hadlee, Marshall and Lillee. The analysis looks first rate and the results are interesting. No surprise that Murali is #1 in aggregate given the incredible number of wickets he has taken at such a good average. I was happy to notice that the bowling rankings (which look a lot less controversial than the batting rankings I produced) had a similar Bradman vs Tendulkar feel about them. Two bowlers that are rarely mentioned as all-time greats are SF Barnes and George Lohmann however a quick look at their records reveals that they are quite ‘Bradmanesque’. Barnes (as you mention) took 189 wickets at 16.43 while Lohmann took 112 wickets at 10.75. Both players have averages that are around twice as good as any modern day great, but over relatively short careers by modern standards. If average is the criteria to be used then Lohman in particular should be regarded as an even more impressive player than Bradman. My view is that the cricketing public is probably correct in not ranking these two players above Warne, Murali, Ambrose, McGrath, Hadlee, Marshall, Lillee etc. Relative to today they played at a time when test cricket was a very ‘small pond’ - conditions were favourable and competition was sparse. 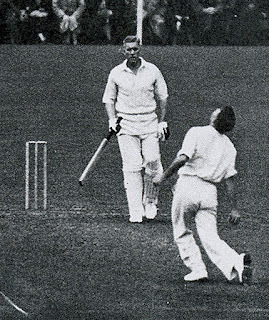 It would be easy for a champion player from that era to be extraordinarily dominant, just as Bradman was in his era. Note that there is an inconsistency in ranking methodology here, as the rationale for preferring, say Warne to Lohmann, is exactly the same (albeit to differing degrees) as the rationale for preferring Tendulkar to Bradman. If Lohmann is discounted relative to Warne because he didn’t play much cricket and his era was much less competitive, then the same principle should apply to Tendulkar relative to Bradman. Obviously this is all fun and games, however a hard-headed statistical analysis should strive to eliminate this type of inconsistency. Of course we could perform all sorts of adjustments to ensure that the rankings that we produced were consistent with popular opinion. However if this were done the statistics would be conforming to suit our prejudices rather than informing our opinions, which is the wrong way to go. Umm - Andrew Hall (SA) with 45 Test wickets at an average of over 35 is rated the 11th best bowler of all time according to the second list! Wowie..